As a market leader within the construction industry we attract and employ the best people from a wide range of disciplines. Their skills, attributes and experience prove them to be specialists in their field. All our staff are dedicated to ensuring that complete client satisfaction is always part of the service. 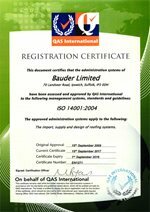 Bauder takes pride in the quality of personnel we employ.